Lodge on Main - Walmer Accommodation. 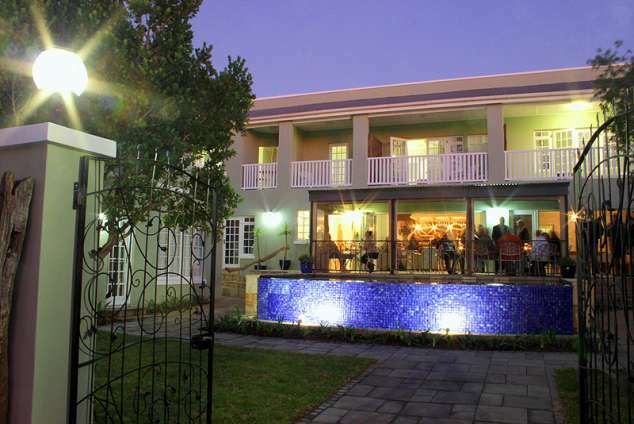 This boutique hotel style guest house owned by Craig Morris (of Newcast) and Kim Weissensee (CEO of Zenith Optimedia) and successfully run by lodge manager; Shaun Munna is now also Port Elizabeth's first class, first choice function venue. The sincere passion and invested interest from the owners is visible in every detail and care that's been taken to turn the establishment into what it is today! The modern conference venue can seat 15 in the boardroom and 30 in the main meeting room. Boardroom and meeting room are separated by shutter doors and when combined the venue is suitable for 40 delegates. (See conference configuration table) The meeting rooms are carpeted for warmth in winter and have airconditioning for summer months. A full day conference package is reasonably priced from R185 per delegate and a R650 venue hire fee. Half day conference venue hire @ only R450. Kindly see further rates and inclusions on conference page. From the moment you enter the door you'll appreciate the warm welcome, friendly and professional staff, and during your stay you are sure to notice the attention to detail, personal touch and care taken to meet all your business or leisure travel needs and requirements. Right down to the sunblock curtaining with your ultimate sleeping comfort in mind. There are nine stylish bedrooms that have specifically been named after the breathtaking tree paintings featured in the room. All are equipped with flat screen tv's and individually controlled dstv (hospitality bouquet channel selections,) tea and coffee stations, ceiling fans and bedside radio alarm clocks. Some rooms have private balconies while 2 overlook the picturesque back garden. Rooms 7 and 8 can be combined for a family or group of four and consists of 2 bedrooms 2 bathrooms, patio and a fully equipped kitchen onto cosy lounge/tv room. This family cottage can be booked on either a bed and breakfast or self-catering option and is absolutely ideal for long stays/short term rentals. Regrettably not pet friendly. Please enquire for long stay special rates. Come and indulge in the luxury of this magnificent establishment by booking your next cocktail party, year end function, product launch, small intimate wedding, awards evenings, bridal or baby shower with us today and prepare to be impressed! We have bragging rights about our competitive 3 star rates while guests enjoy 4 star luxuries and service! The elegant and trendy new bar with heartwarming wood fireplace and function venue which flows onto an undercover patio overlooking lush gardens and rim flow pool which also happens to be weather protected by canvas dropblinds will bedazzle you and your special guests at your next special occasion! The guest house is also ideally located close to all main shopping centre's, Walmer Country Club golf course, health spa's such as Shambala, and is surrounded by popular bistros, coffee shops, and restaurants like the Pop Shoppe and Brioche with mouthwatering cuisine within walking distance from the lodge when you feel like a night out on the town there are also popular nightclubs nearby. Lodge on Main guests only ever leave with a smile wishing to return. We look forward to adding you to our very own Lodge on Main special guests family tree! The jazzy Janiper room just like all our rooms has been designed with your business travel needs in mind. With work station, wifi throughout, bedside radio alarm clocks, and even sun block curtaining for your ultimate sleeping comfort, Lodge on Main’s elegant rooms meet all your business or leisure travel needs! Room 1 has a double bed and comes with a balcony overlooking the beautiful front garden as well as a modern en-suite with shower. The divine Divi Divi unit has brilliant sunlight and a balcony overlooking lovely front gardens as well as a modern en-suite bathroom with shower. It’s 2 single beds easily convert into a king sized bed. Ideal for a bride and 2 of her bridesmaids to enjoy the special occasion. The beautiful Banyan room, like all our amazing bedrooms, is tastefully decorated and has an exclusive mini corner balcony. Awesome Angel Oak is very spacious and has views over the lovely back gardens. The room also has a full modern en-suite bathroom, large lounge area and queen sized bed. The brilliant Baobab has a double bed and separate full bathroom. It opens onto a lovely undercover patio along with outdoor furniture. This room can also be booked along with the self-catering kitchen and lounge for self-catering/longer stays. Our ambient Acacia room offers guests 2 single beds (converts to King) When booked along with room 7 and/or the adjoining full lounge and kitchen it is ideal for longer self-catering stays. Rooms 7, 8 and 9 are also privately accessible from alongside the establishment. When rooms 7 & 8 are booked together the cottage can sleep up to 4 people and opens up onto a lovely patio area equipped with outdoor furniture with your ultimate relaxation and comfort in mind. There is also a full kitchen with built in stove and oven making this a perfect option for long stays/short term rentals. From the Port Elizabeth Airport, turn left into Allister Miller Drive, which becomes Third Avenue, Walmer. Turn left at the intersection of Heugh Road and Third Avenue. Turn right at the intersection of Six Avenue and Heugh Road. Turn left at the intersection of Ninth Avenue and Heugh Road. Turn left at the intersection of Ninth Avenue and Main Road. 11301 page views since 30 Jan, 2009.